Over the weekend, I attended one of my favorite events of the year- The Big Chocolate Show in NYC. I have been going for years (except for a couple of years when I was too sick and/or they didn’t have it in NY.) So I thought it would be a perfect time to talk about my favorite (healthier) chocolate bars. I’ve been excited about this chocolate since the first time I tasted it at a holiday fair a couple of years ago. This company makes chocolate bars with simple ingredients (and no refined sugar- they use raw honey) infused with Ayurvedic superfoods. So it’s basically a health food. 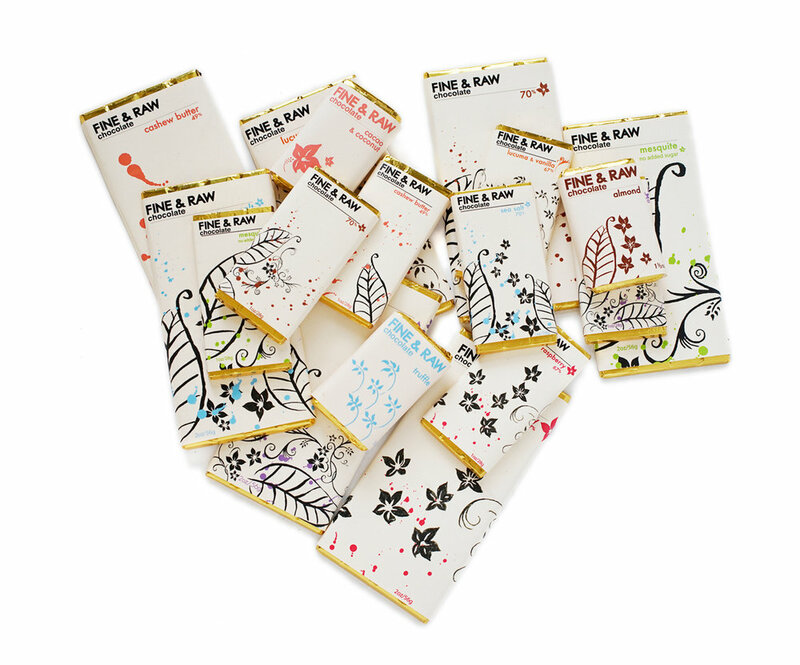 The chocolate is raw and organic, and they donate 25% of their profits to help underprivileged children in India! According to their website, each member of the team invests at least five hours of his/her time every week in giving back to community. They also prioritize sustainability in their sourcing of ingredients and packaging. So awesome! My favorite flavors are the raspberry beetroot and the peppermint lavender, but all the flavors are fantastic. I also highly recommend their hot chocolate. You can buy them here or on their website. I love eating at Hu Kitchen in NYC. They have tons of paleo and vegan options, and I love that all their food is gluten and dairy- free, and free of soy, preservatives, canola/vegetable oils. They also have delicious chocolate bars with minimal ingredients. 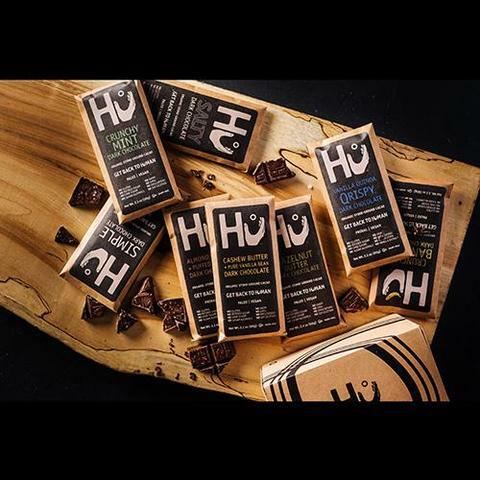 Their bars are organic, fair-trade, paleo, vegan, dairy-free, gluten-free, and soy-free. Their chocolate has the perfect amount of flavor, sweetness (from coconut sugar) and creaminess. My favorites are the Vanilla Quinoa, Hazelnut Butter, and Cashew Butter and Vanilla Bean, but I recommend all of them. You can buy them in the store, on the website, or buy a sampler pack here. I discovered this chocolate while shopping on Thrive Market last year, and have been addicted ever since. Their chocolate bars and truffles are raw, vegan, soy-free, organic, fair-trade, gluten-free, and sweetened with coconut sugar. I really like the Aztec Crunch bar (cacao nibs make it crunchy), and the Love Truffles, which remind me of the Guylian Belgian seashells I ate growing up. Some other flavors I want to try are the coffee crunch and smoked salted almond. (If you want to join Thrive Market to get this and or other items for discounted prices you can click here for 25% off your first order!) Or you can buy them on the website. This brand of chocolate is raw, sustainable, vegan, and sweetened with coconut sugar. My favorites are lucuma and vanilla (according to the website, “We mix lucuma (a Peruvian fruit), cacao, & vanilla into a bar that tastes like a magical mixture of toasted marshmallow cookie, bread pudding, & melted ice cream. 67% dark and yet wonderfully creamy”), sea salt, mesquite (which is naturally sweet, so there is no added sugar in this bar!) and the truffle chunky and hazelnut chunky which are extremely smooth and creamy. They also have truffles and chocolate spreads which I haven’t tried yet. You can buy them on their website or at certain health food stores such as Whole Foods. These bars are gluten-free, dairy-free, and soy-free, vegan, and sweetened with coconut sugar and/or maple syrup. Besides chocolate bars, they also make coconut butter cups, spreads, and hot chocolate (the hot chocolate is the only non-vegan item because it contains collagen.) I am a big fan of the signature dark, crunchy caramel, and cashew milk (which actually tastes like creamy milk chocolate!) I also love their coconut butter cups- I have had the classic, peppermint, and caramel sea salt. They also make roasted coconut butter and chocolate spreads which I haven’t tried yet. You can buy them on Thrive Market for a discounted price, on their website, or you can buy packs on Amazon.